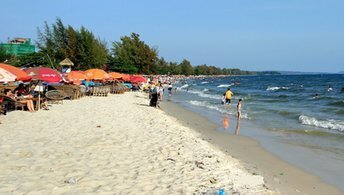 This beach ranks #6 of the "Best beaches in Sihanoukville"
Most of the hotels can be found in the northern beach area (room from US$10 to US$70 per night). However, the south end of Ochheuteal Beach has also several hotels with rooms being about US$30 per night. The best time for a holiday on Ochheuteal beach is a dry season from November to April.